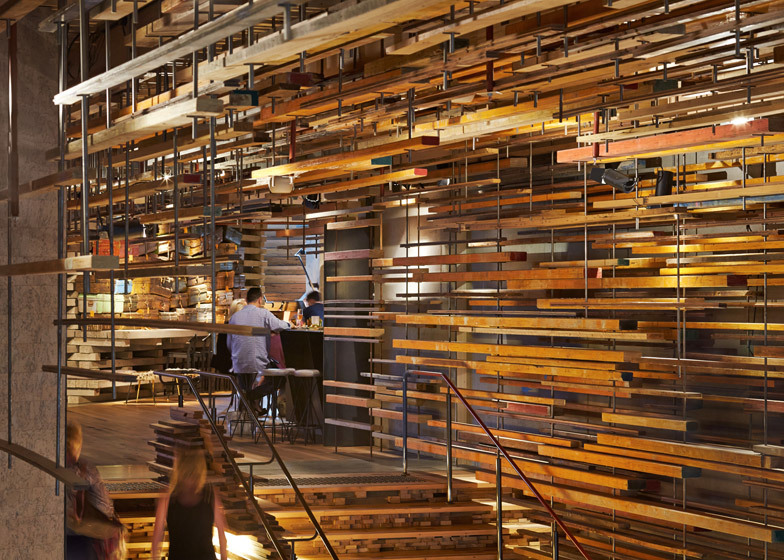 Lengths of reclaimed timber envelop the grand staircase that Melbourne office March Studio has created at the entrance to Hotel Hotel in Canberra, Australia (+ slideshow). 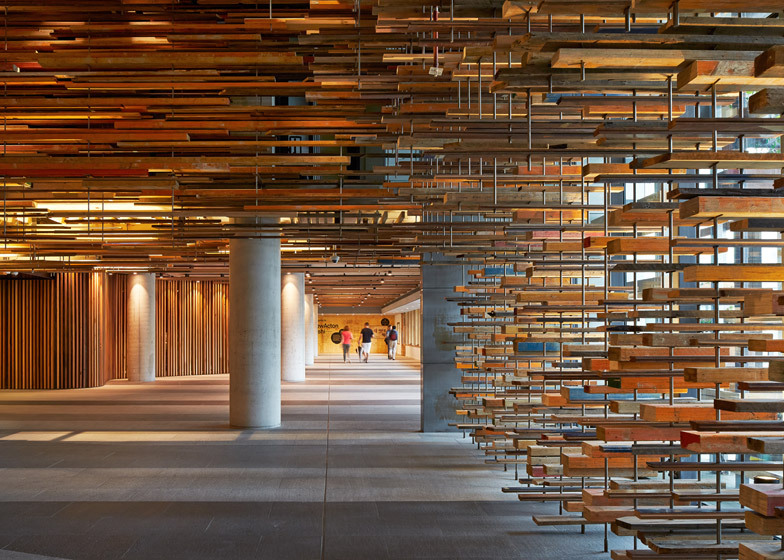 March Studio was commissioned to design the lobby for the Nishi building – a mixed-used development in Canberra's arts and culture precinct New Acton. 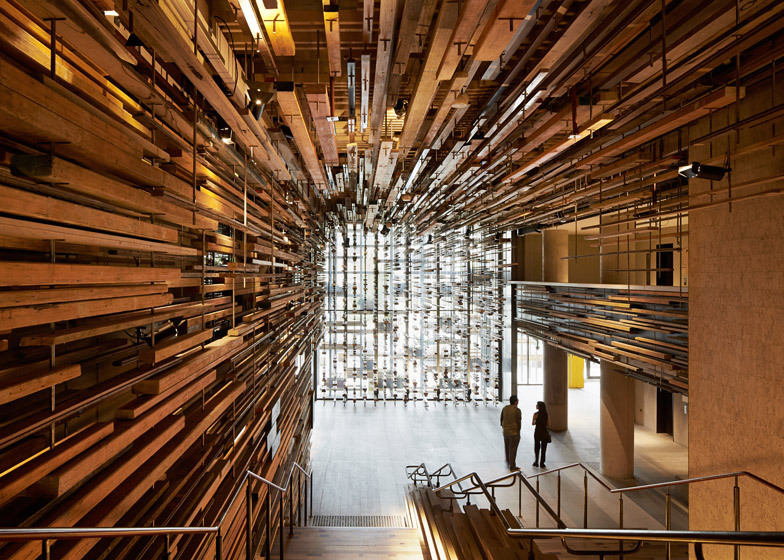 The grand staircase links the apartment blocks with the hotel, whose design was developed by 50 artists, designers and makers including Japanese studio Suppose Design Office. 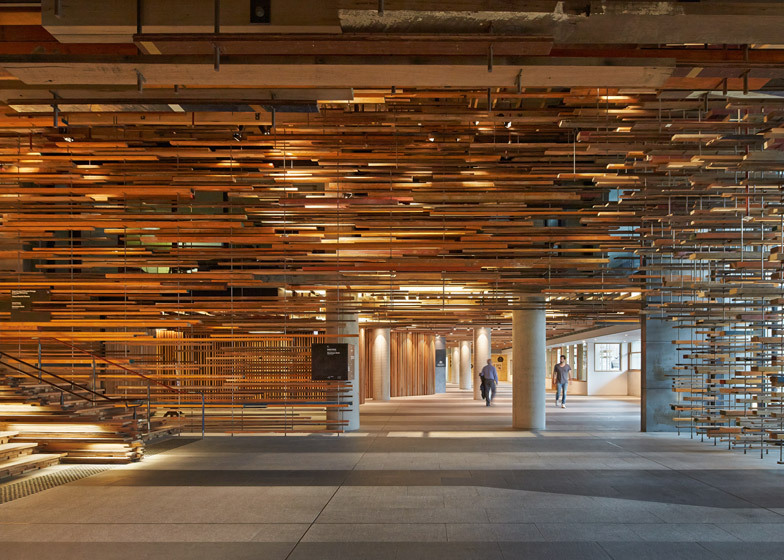 The space features thousands of pieces of recycled wood, which are fixed around the walls and ceiling to create irregular patterns around the building's precast concrete pillars. 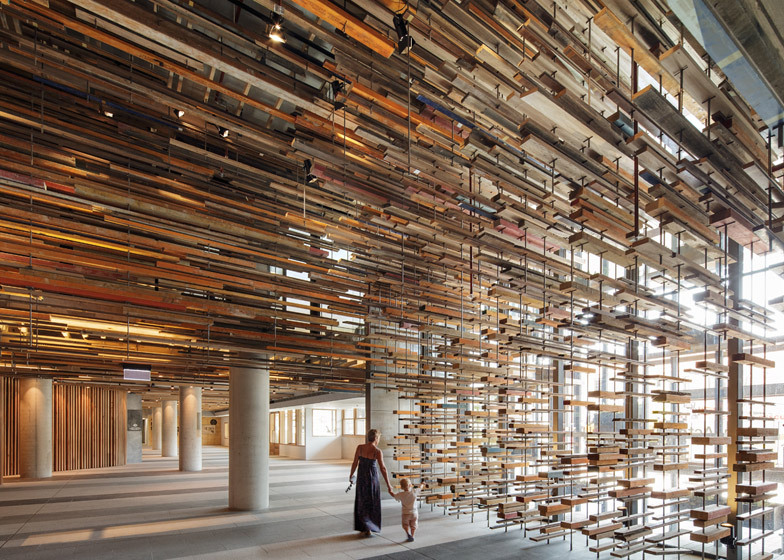 "Freed to scatter up the walls and across the ceiling, the suspended timber filters exterior light and views into and from internal spaces," said March Studio in a statement. "Spidery, pixellated shadows are cast on the floor and bare walls." 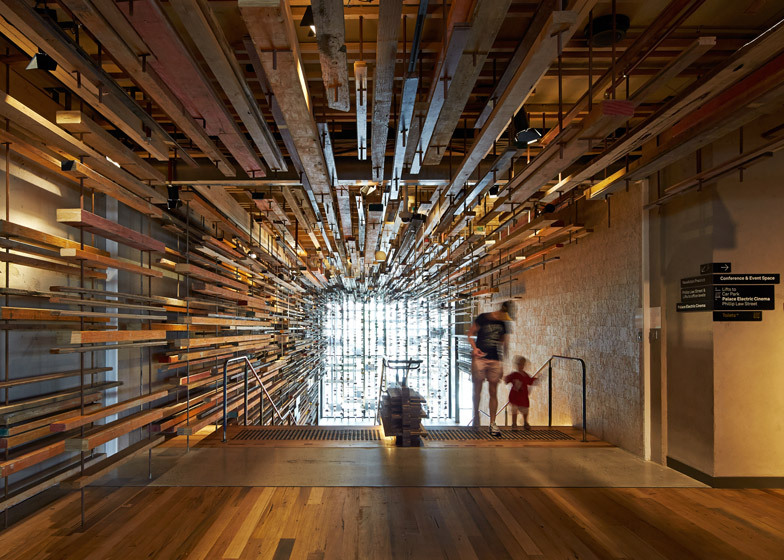 The lengths are supported by steel rods that run from the ceiling to the ground floor, while sparser clusters of timber-covered steel rods line the front of the entrance. 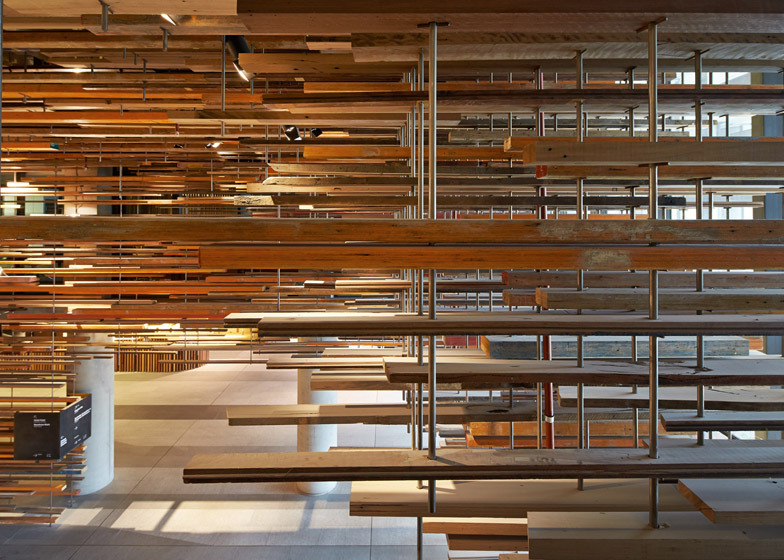 Each tread of the staircase is made up of three different types of glue-laminated timber profiles. 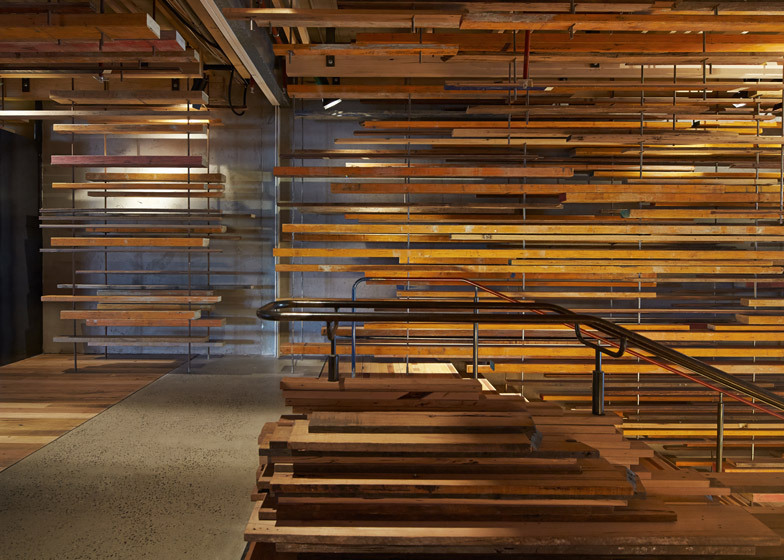 "In the stair the timber is heavy, grounded, a stacked agglomeration," said the studio. Longer lengths of timber profiles protrude from the middle of the staircase to create an illuminated central balustrade. The staircase leads up to the hotel lobby and bar, which occupies two floors of the building. 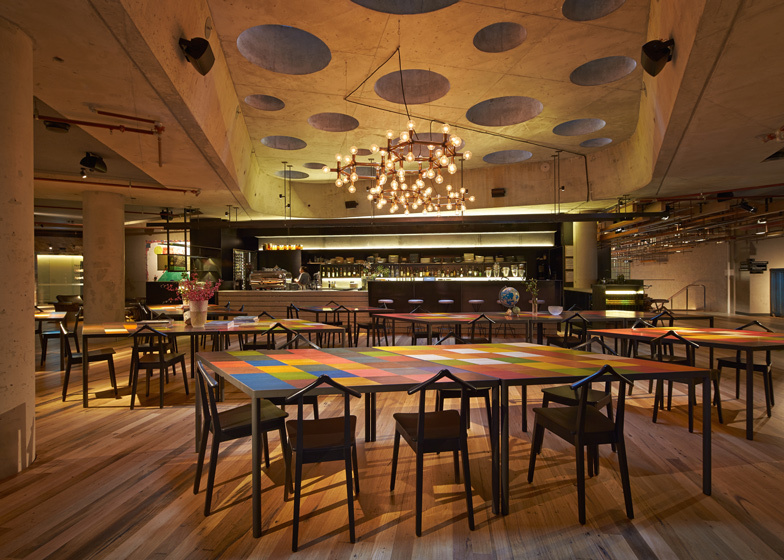 Here, chunky lengths of concrete and timber create bulky pieces of furniture, while decorative lighting fixtures hang from the ceiling and circular skylights bring in daylight from overhead. Photography is by Peter Bennetts unless otherwise stated. On the ground floor of the boutique hotel, March Studio was engaged to create spaces which encouraged residents, guests and visitors to linger in what can oen be a transient space. 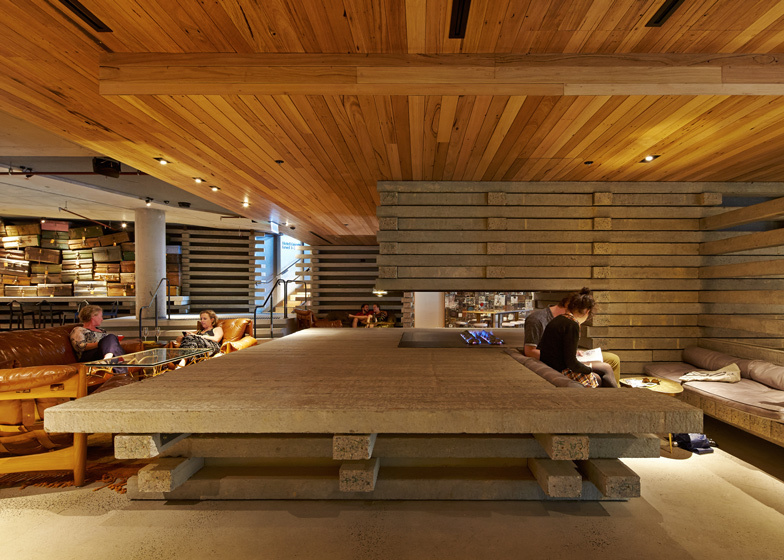 The walls in the hotel lobby - and the seating, the benches, the counters - are an attempt to bring the handmade into the rigorous, polished building around it. Materials - custom gluelam timber, precast concrete beams - are allowed to sit, unadorned, stacked in a simple manner, overlapping, their joints overrunning and poking out. The singular system - the same for both materials - is stretched where needed, opened where useful, broken where forced. A large space is enveloped in this manner and then diffused, variegated by operations within these rules, to allow for spaces which have their own character. Doors that are part opening, part display, continue this language in apparently weightless steel. 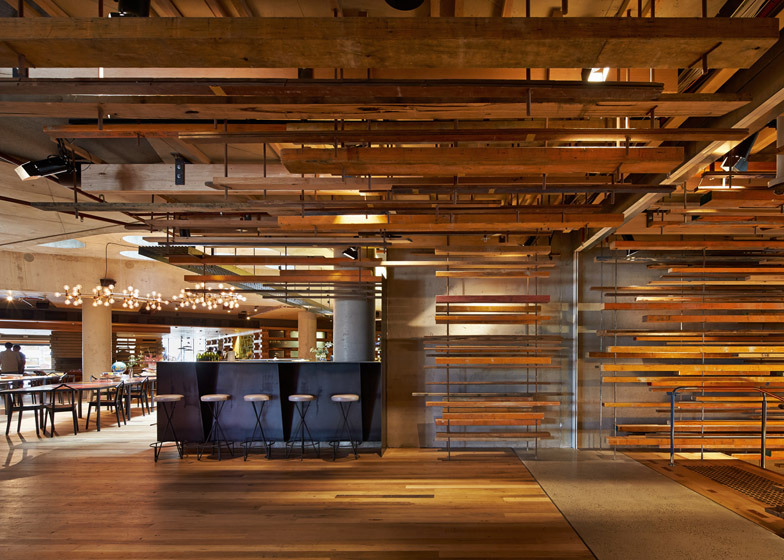 This steel is picked up to lighten the bar, where stacked concrete props up sleek steel, which weaves into and halts the flow of suspended timber bursting up the stairs from the commercial lobby. Above the seating in front of the bar, large holes have been punched into the concrete slab capping the space. These portholes allow glimpses into the courtyard above and natural light to enter the space. The main entrance to Nishi Residential, opposite the linking stair, was also part of March Studio's brief. 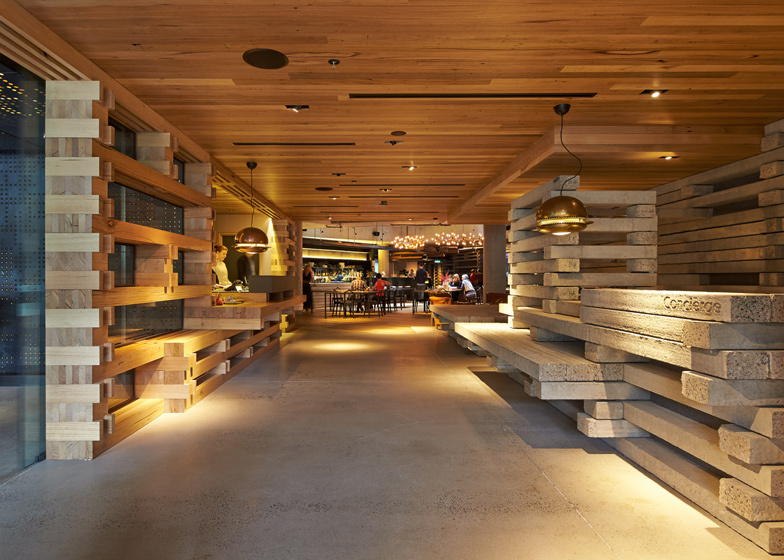 Outside is a canopy which shrugs off its weight with flowing timber recalling the Commercial Lobby. The entrance airlock is lined on two walls and ceiling with what could be steel punchcards for an ancient mainframe. Filling the gaps punched in these steel sandwich panels are amber marbles, thick glass which filters the light and warms the space. 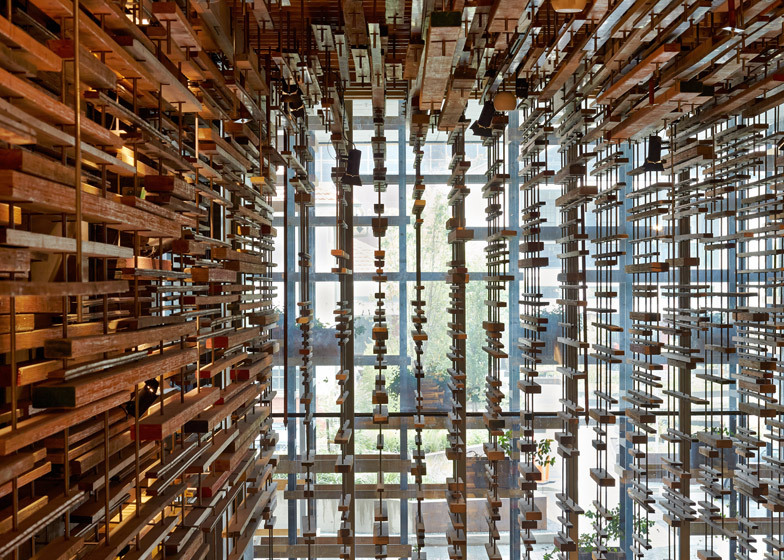 The directionality of the commercial lobby is mirrored here, in the lines of punched holes on wall and ceiling, which scatter across the rear wall and flow into the stacked timber of the HotelHotel library.